1,600 square feet of quality antiques and collectables. Each 10 foot by 10 foot booth is well lit, clean, tidy, organized and stocked with items of interest to all ages.Many of the booths are specialty booths that is they feature nostalgic, retro, primitive, deco, antique or collectable themes. With well over 115 dealers, those browsing the mall will find millions of items ranging in price from as little as a dollar to thousands of dollars, sold by vendors from 14 years of age to 80. 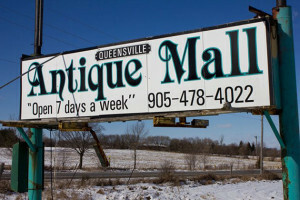 The wide spacious isles and wide entrance doors make the mall accessible to the handicapped, in wheels chairs or walkers.The Queensville Antique Mall staff and merchants are also active members of the community. The mall works with a number of local groups like the Yellow Brick House, Sionito, Spinal Cord research, food drives, toy drives, and NHL Old Timers, putting on fashion shows,and other special events through out the year.So if you are an antique or collectable buff, or just someone with a bit of time on your hands, drop in and take in the warm friendly hospitality at the Queensville Antique Mall. We are a Pet Friend enviroment for all pets that can be held or carried in your arms. Layaway, Delivery and Shipping Available. The Queensville Antique Mall is open 7 days a week 10am-6pm. For more information please call 905 478 4022 or visit their facebook page.